You will receive 5 sets (5 of each pin) of the pins that are shown in the picture of this listing. 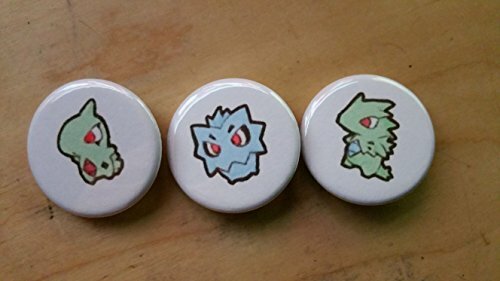 All pins are about 1" inch in diameter and have a pin back. If you have any questions please feel free to ask! We are here to help with anything! Great for party favors! If you have any questions about this product by Legacy Pin Collection, contact us by completing and submitting the form below. If you are looking for a specif part number, please include it with your message. Pokemon Eeveelution Card Lot Collection - Featuring Eevee Plus Jolteon - Flareon - Vaporeon - Espeon - Umbreon - Glaceon - Leafeon - Sylveon! Mixed Rarities GX - EX - Holo - Foils! Comes in GG Box!